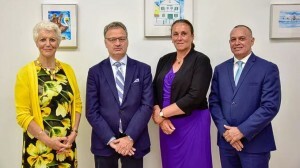 WILLEMSTAD - The Financial Supervision Board, Cft, believes that the implementation of agreements between Curacao and the Cft is an important step towards sustainable public finances. This is what Cft chairman Raymond Gradus said yesterday during a press conference in which it was announced that no advice is given for a financial measure from the Kingdom Council of Ministers. But the Cft also thinks economic growth is necessary, and certainly, also the flexibilisation of the labor market and the reduction of red tape and the administrative burden said Gradus. The Cft demands the government be energetic and decisive about this matter.